Twelve students from the Nixya’awii Community School who attended an intensive writing workshop at Whitman this summer discovered the power stories hold “to define and name and enthrall,” in the words of Don Snow, senior lecturer of environmental humanities and general studies. They weren’t alone. The experience reaffirmed that power for their professors as well. 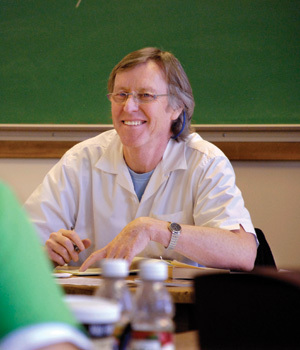 Don Snow, senior lecturer of environmental humanities and general studies, enjoyed working with Nixya’awii students during a summer writing workshop. The three-day workshop, coordinated by Kay Fenimore-Smith, associate professor of education, was the latest event in the continuing partnership between Whitman and the charter school on the Confederated Tribes of the Umatilla Indian Reservation. Snow began the workshop with an eye-opening session on how to write essays and letters of introduction, requirements for many college and scholarship applications. “I never knew I could write like that,” one student wrote in an anonymous evaluation of the workshop. A field trip and journal-writing exercise on the second day of the workshop took students to Treaty Rock on the Whitman campus, the statues of missionary Dr. Marcus Whitman and Walla Walla tribal chief Peo-Peo-Mox-Mox in downtown Walla Walla, and the Whitman Mission National Historic Site west of town. “The Whitman Mission did seem to be an important place of reckoning for these students,” Karson said. 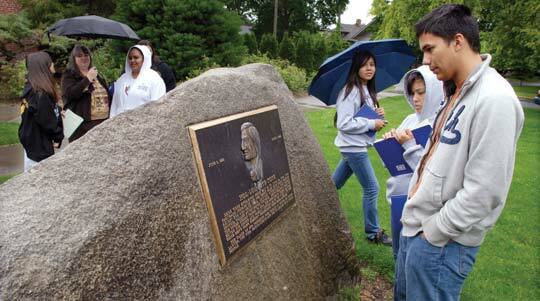 Nixya’awii Community School students visited Pe-Wa-Oo-Yit, known on campus as Treaty Rock. Treaty Rock was a gift to the college in 1955 from the Yakama, Nez Perce, Cayuse, Walla Walla and Umatilla tribes to commemorate the signing of treaties with the U.S. government in 1855. Members of the Cayuse, Umatilla and Walla Walla tribes make up the Confederated Tribes of the Umatilla Indian Reservation. The student felt the same way when forced to abandon “her own” language in kindergarten, Roberts said. Roberts was proud of her students and thrilled to experience the words of this poem coming alive for them. “They made me love the poem even more than before, for which I’m extremely grateful,” she said. Editor’s note: The Confederated Tribes of the Umatilla Indian Reservation founded the Nixya’awii Community School in 2004. A $25,000 gift to Whitman (including $10,000 toward a scholarship to Whitman for a Nixya’awii graduate) from Washington Mutual Bank in 2005 allowed the college to partner with the Nixya’awii school to study, evaluate and promote student progress, and encourage students to perceive college as a realistic goal. Kay Fenimore-Smith spent her 2006 sabbatical teaching at the school and evaluating its progress. Her findings have since been published.